Special thanks to Jovana Minutinovich for translating this page into Serbo-Croatian! Seriously, it’s actually in Serbo-Croation! Cool, eh? Let’s say that you’re interested in writing a chemical equation, but your teacher hasn’t given you any formulas. In fact, let’s say that your teacher, instead of giving you an equation, has just told you what the equation is like. 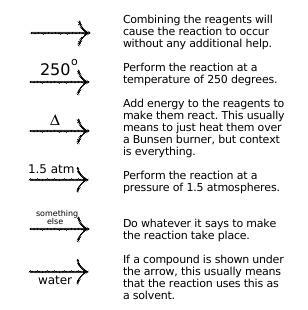 For example, maybe your teacher told you to write the equation for “calcium reacting with hydrochloric acid to form calcium chloride, water, and heat.” What should you do? Hint: “Shoot heroin” probably isn’t the best answer to this question. Your best option is to read the tutorial below and then do what it says. Not only is is much better for you than heroin, but it’s also safer, cheaper, and less likely to get you arrested. When hydrogen gas is heated with oxygen gas, water vapor is formed in an explosive process. Before you can write an equation of any kind, you need formulas. To do that, you’ll have to go back to another tutorial and figure out how to do it. (Links: Ionic naming tutorial, covalent naming tutorial). If you thought you were done with balancing equations forever, it’s time to come back to the planet Earth. Or wherever it is you used to live. (s) is used to indicate that something is a solid. (l) is used to indicate that something is a liquid. (g) is used to indicate that something is a gas. (aq) is used to indicate that something is aqueous, which is to say that it’s dissolved in water. Don’t use (d), even though it makes more sense. “Molten” or “melted” refer to the liquid state of a material. “Vapors” or “fumes” are gases. If something is said to be in solution, it’s aqueous. If something is “powdered” or “ground up”, it’s a solid. If an ionic compound is formed in an aqueous environment, use a solubility chart like the one here to determine if it will be aqueous or solid. It’s usually interesting for chemists to know whether a reaction gives off or releases energy, mainly because they don’t want to be surprised when something explodes. As a result, equations are generally shown in a way that gives away this vital piece of information. To do this, a symbol shown as ΔH indicates what happens with the energy. If ΔH is positive, this indicates that a reaction is endothermic (i.e. it has absorbed energy and the container it’s in will feel cold). If it’s negative, the reaction is exothermic (i.e. it releases energy making the surroundings hot). If you are already familiar with ΔH values or are told a specific value for ΔH (it will most likely be in the form of “242 kJ/mol”), use that value. Otherwise, your instructor may or may not want you to just write “ΔH = +” for an endothermic reaction or “ΔH = -” for an exothermic reaction. It’s probably best to ask. Heroin addict: David Castillo Dominici via freedigitalphotos.net. All other graphics were made by me, because I’m awesome.